emerge is our local band night, showcasing exciting new local talent. Come along to support these talented artists and potentially see the international stars of the future! This emerge will feature KYU, Powderhead, Salvador, and Swimsuit Competition (not necessarily in that order!). Remember, emerge nights are for bands to perform and be supported by an appreciative crowd that will get to hear some great music, so all bands/artists and their fans are very much encouraged to support the other performers. Therefore if you are coming to see one band, please try to come for the whole evening – the bands will definitely appreciate it, and you will have a great time! Adv = Advance; Otd = On the door. Advance tickets can be purchased through our ticket partner, WeGotTickets.com (subject to a 10% booking fee), or direct from our Box Office (no booking fee). Advance booking closes at 6pm on the day of the event unless stated above. All events are standing unless stated above. If you have any specific requirements, we are more than happy to accommodate you, though it would help us if you could inform the box office prior to the event. A vibrant arts centre based in Stowmarket, in the heart of Suffolk and just 5 minutes walk from the Norwich-Ipswich-London railway line. We take pride in hosting a variety of original music, from established acts to emerging talent. We also host poetry, film, theatre, and comedy. In addition the centre is offered for hire to members of the public, to run their own events. Our licensed bar serves soft drinks, wines, spirits, Adnams, and Aspall. Special thanks to Stowmarket Town Council, principal sponsor of the John Peel Centre for Creative Arts. 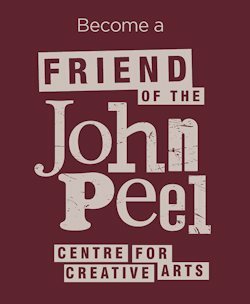 Want to perform at the John Peel Centre? Copyright © 2019 John Peel Centre for Creative Arts. All rights reserved.